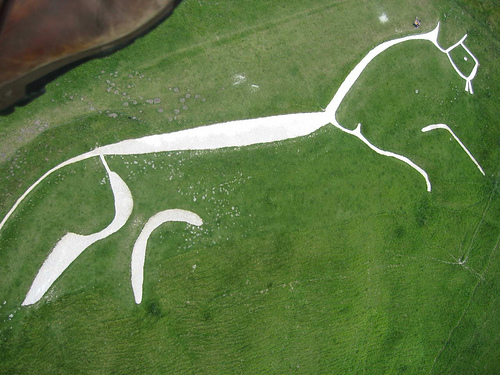 Located at Berkshire Downs this 3000 year old horse is carved into the chalk hill with trenches 5 - 10 feet across and 2 - 3 feet deep. Every few years it needs to be cleaned (scoured it's called). For thousands of years the village people would get together for this purpose using it as an excuse for fun and games. Many believe that the horse represents the Goddess Epona and that it was created for pagan ceremonial worship. It was a long climb up the hill to the horse, many walked along with me. The site is very popular for local families as well as tourists. The horse is purely marked, though while on the hill it's hard to tell exactly what part of the beast you're actually standing on! Eventually I found my way to the face, then the eye of the horse, where I sat down (you really aren't supposed to sit on the chalk). I planted my hands on either side of me, fingers spread and pressing into the chalk, and with my eyes closed tried to imagine what made people first carve, then maintain this spectacular image for so many thousands of years. All the while I KNEW that Dragon Hill was just a few meters away. I had never seen it, never even heard of it until I came to England, but my body shuddered at the thought of the nearness of it. I picked up a small piece of chalk from the horse's eye, popped it into my pocket and decided to face my fear. Dragon Hill was waiting. Dragon Hill is a man-made mound with a flat top. 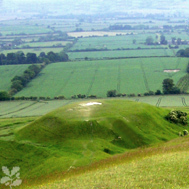 The legend is that it was at the summit of the hill that St. George slew the dragon. There's a bare patch on the top of the mound where nothing will grow, it's supposed to be the very spot that the dragon's blood spilled. With each step up the hill, I felt uneasiness growing within me. The clouds had covered the sun and the wind began to whip my hair into my face, winnowing it's way inside my clothes until I began to shiver. When I reached the top and stood upon the barren spot, my mind was reeling with violent scenes of men and beasts in mortal struggles, of blood sacrifices, of fear and destruction and of death without redemption. I could only remain upon that cursed ground for a few moments before I fled. Was cut out of grass"
Saint George was Patron Saint of England in the days of King Arthur and the Knights of the Round Table.In English folklore, Saint George slew the mighty dragon on Dragon Hill near Uffington, Oxfordshire, According to legend, the towns folk were being terrorised by a dragon. The locals kept throwing sheep to it to placate it, and when it still remained unsatisfied, they started sacrificing some of the citizenry. 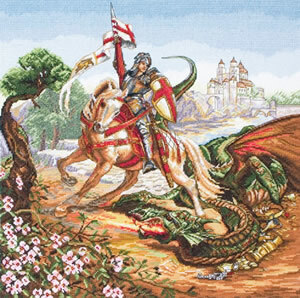 Finally the local princess, Cleolinda, daughter of the King, was to be thrown to the beast, but Good Saint George came along, slaughtered the dragon and rescued the fair princess. At this the townsfolk converted to Christianity. Some experts think the tale is based on the Greek myth of Perseus rescuing Andromeda from a sea monster.